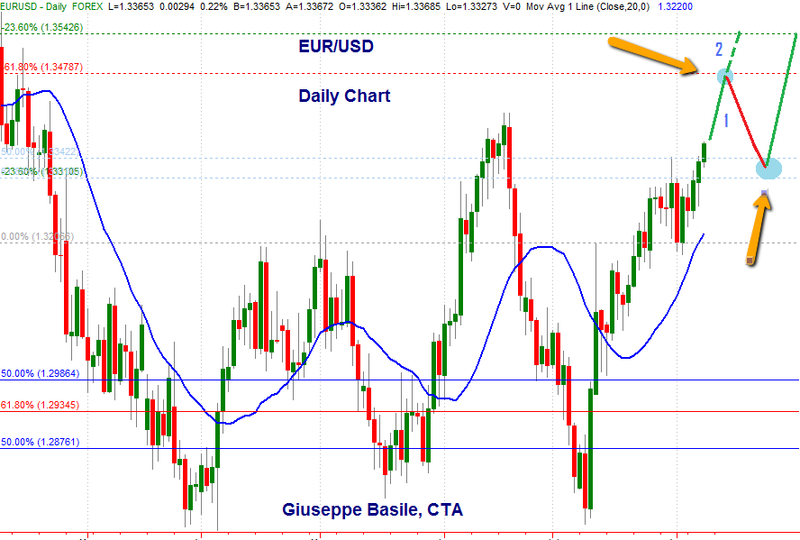 The EUR/USD pair is continuing in the scenario identified when it bounced from the support area at the 1.2990 on July 15th, 2013. This pair is now moving towards the second target of that setup. That target is at 1.3470. Scenario 1. If and when price gets into the 1.3470 area of second target we will almost surely see profit taking from Program Trading on the daily timeframe. This is the norm and this is also the high probability scenario. Scenario 2. There is a small possibility for price to continue higher, but only in the context of a Dollar crash scenario. But we are not yet there (maybe). If scenario 1 plays out as I anticipate, the profit taking that will follow is likely to bring price back into the 1.3340/50 area. There Program Trading is anticipated to resume the move higher in the Euro. I want to remind you all that the longer term target for the Euro is in the 1.41 area. Please review last weekend s weekly review videos. I send a free Newsletter on Sundays and provide updates throughout the week. You have still time to subscribe. The newsletter typically includes: a weekly review for the Euro-Dollar cross, my FibStalker View on Currencies focusing on Forex pairs, articles on my trading method, market commentaries and HFT/Program Trading. Please, register here to receive the free weekly newsletter. The GBP/USD pair is now back in track and mimicking the EUR/USD pair. I think this pair is going to trade higher along with the Euro/Dollar, but this is only my opinion. Scenario 1. 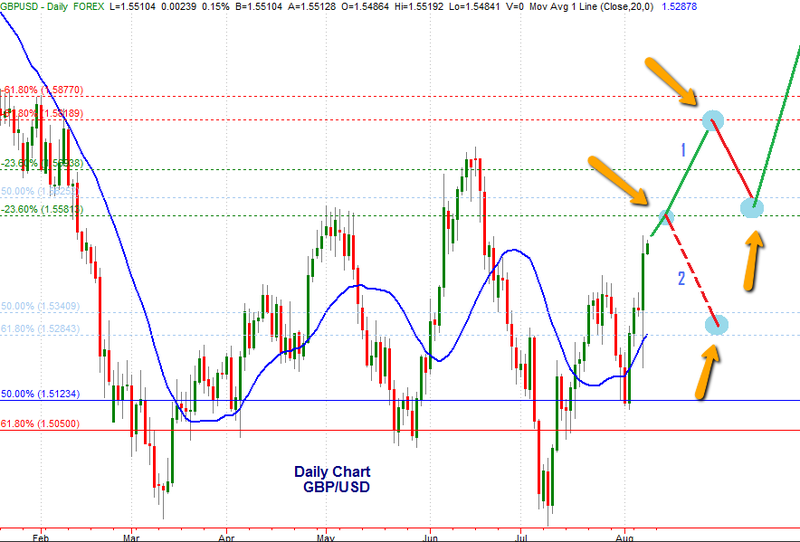 GBP/USD pair price could just continue higher to hit the second target in the 1.5815 area, i.e. 2nd target of the current daily setup stared at the 1.5120 area (blue line in the picture). This is the high probability scenario. Scenario 2. Price could correct due to profit taking and shorts on the smaller timeframes into the next traditional long setup whose support area starts at the 1.5340 level and goes down into the 1.5284 level. Below 1.5284 the current upmove would be invalided. In the morning I have prepared this chart but have not have the time to share it. Being the market in a weekly short and due to renewed weakness in the Dollar in the last 4 days I was anticipating scenario 1 to play out (continuation lower). Indeed today we had the continuation and by piercing the 1.0318 level price confirmed the next target (according to my model of Program Trading) at 1.0160. 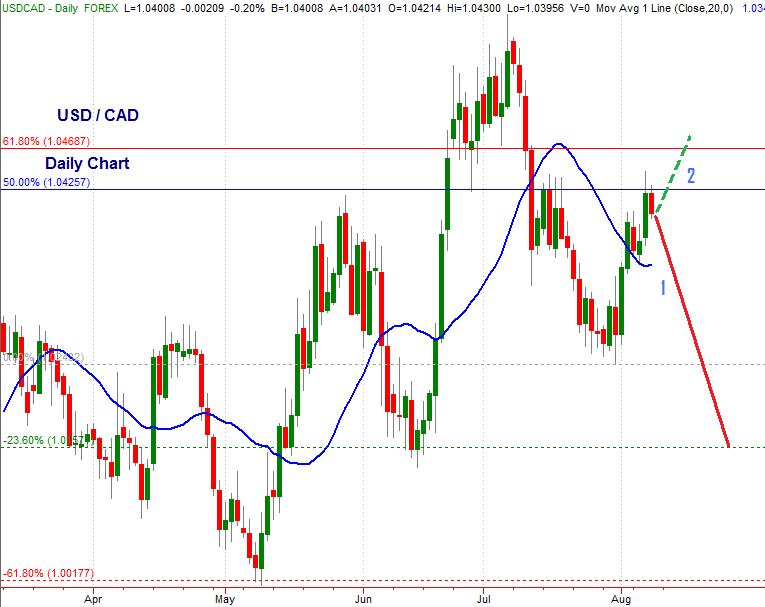 The AUD/USD pair is in a counter trend trade driven mostly by Dollar weakness. While technically our model of Program Trading is looking for the 0.85 area of target, we could see price of AUD moving higher relatively to USD. Two are the weekly areas of resistance to watch: the 0.9210 area and the 0.9480 area (see below picture). Several scenarios are still open in GOLD futures and today it looks like the future is following scenario 1 (see below picture). Price found support at the 1,270 area while my model of Program Trading was anticipating slighly lower levels of support starting at 1,265. Price could now just continue higher into the next resistance area starting at 1,380 (scenario 1). However we could also see a further correction into the support area between 1,245 and 1,265. Below 1,265 GOLD could revisit previous lows (scenario 2). I am publishing a quick update for S&P500. I provide updates as often as I can. Notice that price projections in my method are not from/to random levels and do not follow Elliot Wave, DiNapoli levels or other methods, but rather a proprietary method based on modeling effects of Program and Algorithmic Trading on price. While a lot of commentators are calling for a reversal of the S&P500, our model of Program Trading activity shows that the indices is still on track for its move higher. The market found support at the 1673 area that has the 1724 area of target above, well into to that first target area coming from the analysis of the weekly timeframe coming at 1,720/30. As indicated in the last analysis, (also published on FXStreet.com) once and if price hits that 1724 area we could witness a small retrace into the 1707 area (scenario 1), but price of the equity index could just continue higher into the next weekly target area at 1,800 to 1,820. As explained in the last interview with Dale Pinkert in the Live Analysis Room on Tuesday August 6th 2013, when I reviewed this pair on the daily and weekly timeframe, if USD/JPY were to lose the 96.71 level we would see a move southwards. My model of Program Trading activity on price shows that on the weekly timeframe there will not be support to price until 94. 94 is definitely the next level to watch. This level is the start of an area of support which is going to be tested for the second time, on the weekly timeframe. We know that second tests are dangerous tests so there is a real possibility that price could slice through the 94 level and move lower into the 91.62 level. If also that level is lost price is destined to move into the next area of support projected by our analysis at 89.70. Bottom line: my opinion is that if you are short USD/JPY, you may want to keep your position open and take partial profits at the indicated levels.